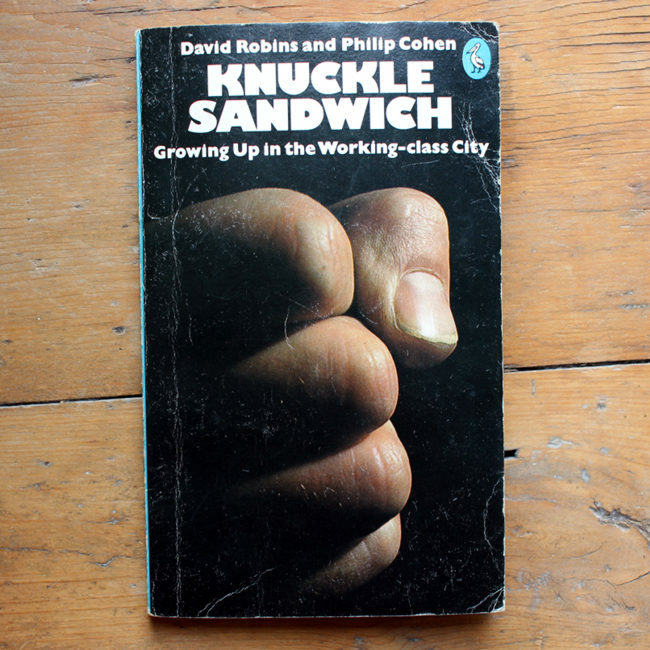 Knuckle Sandwich: Growing Up in the Working-class City is a study of the lives of Ordinary People and so of course features a pub or two. It was writ­ten by David Robins and Philip Cohen and pub­lished by Pen­guin in 1978. The fan­tas­tic peri­od cov­er design is by Red Saun­ders. The back blurb includes a quo­ta­tion from ‘What’s My Name’ by The Clash and there’s plen­ty inside to inter­est stu­dents of youth cul­ture, Lon­don life, and the polarised pol­i­tics of the 1970s. 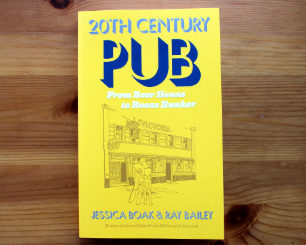 As usu­al in this kind of book all the names are changed, includ­ing those of the estate itself, and the pubs. It’s pos­si­ble some dates and oth­er details were also adjust­ed to make it hard­er to pin down. Mon­mouth estate is a ‘new’ GLC estate: it was first occu­pied in 1960 and is still (1977) incom­plete… In the mid­dle of the estate, as if strand­ed by the tide of ‘progress’, stood the old pub­lic-house, the Black Horse. A sol­id-look­ing build­ing, with a large ground floor for busi­ness, a huge cel­lar, and two upper floors which had served as liv­ing quar­ters. The pub was sched­uled for demo­li­tion, like so much else in the neigh­bour­hood, and there were vague GLC promis­es of a com­mu­ni­ty cen­tre being built there in a few years’ time. What hap­pened next was that local youths, with the guid­ance of rad­i­cal youth work­ers, decid­ed to take over The Black Horse and make it an unof­fi­cial com­mu­ni­ty cen­tre instead. With the back­ing of a local ten­ants’ asso­ci­a­tion, the Open Space Com­mit­tee, squat­ters moved in upstairs ‘qui­et­ly and effi­cient­ly’, act­ing as care­tak­ers. Before this it was used to stash stolen goods and as a hide­out for teenage gangs, so peo­ple gen­er­al­ly found this an improve­ment. The Cross Keys was the rec­og­nized head­quar­ters of the local vil­lains, the fra­ter­ni­ty of scrap men, fences, shot­gun mer­chants – anoth­er rea­son why the [Open Space] Com­mit­tee would not go into it. (It offend­ed their code of moral respectabil­i­ty – not one that was forged out of any def­er­ence to mid­dle-class decen­cy, how­ev­er; it was more that they had a posi­tion to keep up.) He fact that the Cross Keys was often the qui­etest pub in the neigh­bour­hood, and the brew­ers had with­drawn their fran­chise on the place, made some ten­ants sus­pect that the land­lord must be involved in some close work­ing rela­tion­ship with his cus­tomers. Iron­i­cal­ly, the local vil­lains had an inter­est in the Black Horse… It was well-known they were after the lead and tim­bers con­tained in the old build­ing. This was one of the main rea­sons why the com­mit­tee had backed the squat, to pre­vent the roof mys­te­ri­ous­ly dis­ap­pear­ing one night. By all accounts, Gal­lagher ran a tight rack­et and exploit­ed his clients for what­ev­er he could get out of them. He had made a con­sid­er­able for­tune in this rough trade. The area sur­round­ing the Black Horse was con­sid­ered dan­ger­ous large­ly because of his these lads’ pres­ence. Before it closed the Black Horse had been their main drink­ing place. Unlike the Cross Keys it had been rough inside. A few weeks before clo­sure, the pub­lic bar had been the scene of a stand-up fight between the Irish lads and some black work­ers liv­ing in the vicin­i­ty. The rep­u­ta­tion of the Black Horse as a dan­ger­ous and unde­sir­able place to go remained with it to some degree after it closed for busi­ness and opened for the com­mu­ni­ty. This all seems very inter­est­ing in the con­text of the 2010s and the rise of social-enter­prise com­mu­ni­ty pubs. These days such an attempt at revi­tal­i­sa­tion would nev­er involve squat­ters and teenagers and the pub would prob­a­bly remain a pub even if it did gain periph­er­al func­tions as well. One ques­tion to which we can’t eas­i­ly find an answer is where The Black Horse real­ly was, or what it was real­ly called. 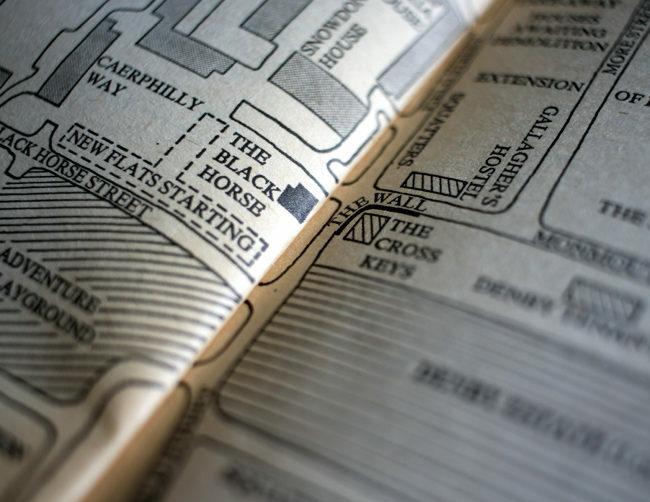 Based on the map in the book we reck­on the Mon­mouth Estate is actu­al­ly the Bemer­ton Estate, off the Cale­don­ian Road. Assum­ing the pubs are placed some­what accu­rate­ly that means The Black Horse was prob­a­bly real­ly The Pem­broke Cas­tle which peo­ple seem to recall as being demol­ished c.1972–3 – per­haps actu­al­ly when it was board­ed up? Or maybe Robins and Cohen obfus­cat­ed the dates a bit, too. And the Cross Keys must sure­ly have been – this is a weird name – The Cob­bled Fight­er. Or maybe not. If you know for sure one way or anoth­er – per­haps you grew up round there, or have access to local news­pa­pers from the peri­od – do drop us a line or com­ment below. UPDATE 11:30 24/04/2017: Ewan of Pub­ol­o­gy fame has looked at some maps and reck­ons The Cross Keys must have been The Inde­pen­dent on its orig­i­nal site. The Cob­bled Fight­er is a bit of a mys­tery, picked up via Pubs Galore, but might have been a short-lived name for the same premis­es. “Cob­bled fight­ers” are bare-knuck­le street fight­ers – i.e. peo­ple who fought in the street (on the cob­bles) for an audi­ence. I can see how it might have seemed like a good idea to name a pub after them, just about, & I can cer­tain­ly see how it might have seemed like a good idea to change the name to some­thing else. The estate I grew up on in Bel­gravia was built in the late 1960s. The devel­op­ers very kind­ly includ­ed a shop that sold crack cocaine, an amuse­ment arcade and a pub. The pub, from mem­o­ry, was either called the Rusty Kumquat or the Sir Fred Housego.